I knew Allan’s case study was going to make an interesting read when he said, “I was working full time until I was 77 when doing two or three jobs became a bit much for me.” – And then he mentioned that he cruises with his ex wife who also has her own narrowboat! Enjoy your retirement Allan! I’m Allan Cazaly, who has had an interesting and varied life, not only in the UK, but also 10-years in Europe, based in Southern Germany. Itchy feet, I suppose? In Germany, I soon became involved in the Holiday business. This took me as far as Poland, Russia, Hungry, Yugoslavia (Then),UK, France to Italy and all the mountain passes; hard work and immensely enjoyable. I have always been interested in canals, ever since I lived in Wombourne, near Bratch locks. 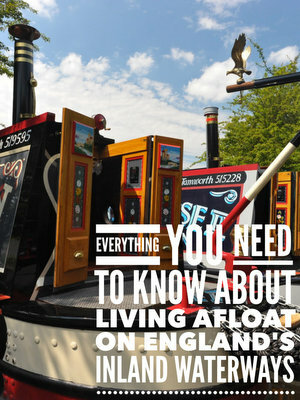 I found narrowboats fascinating then, and still do. I was lucky enough to be able to design the boat of my dreams (Nearly got everything right) and I had enough money to have the steel shell built based on a trad. design (6 years ago). I have been working towards completion ever since. We stayed in touch and he gave me useful information from time to time. 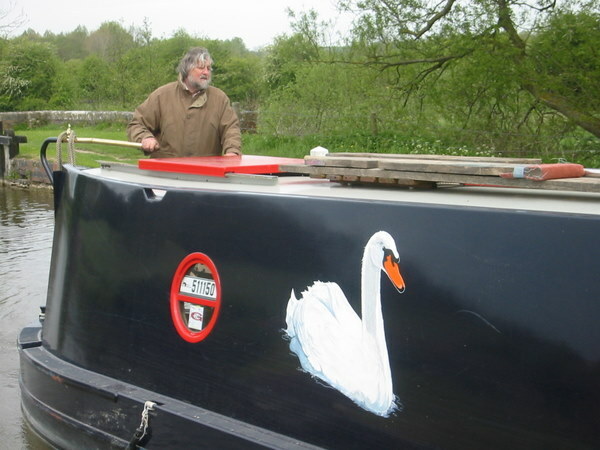 One day, I had an e-mail that said – Christine has found the name of your boat – This was because had decided to have graphics with 2 swans intertwined on each side The name stated was Pengalanty – made up as follows: “Pen”, being a female swan, “Galanty“ being a medieval name for amorous. The name sounded good and it rolled off the tongue quite naturally, so that’s how it came about . The boat is 58’0” long, supposed to be 2.4” draft but there is so much equipment and timber on board that it more like 2’7” and the stern digs deeper when cruising. This is actually more stable, so I am happy with this. I had 2 separate private pensions that I had been paying into for many years. I converted the pensions and used the cash allowance to achieve my goal. As I was working nights, at the time, I spend most afternoons working on the boat. It has taken me simply ages, as I fitted and commissioned the engine (Beta 43), the ballast, flooring, lining out, cladding, all the electrics (To above the minimum standards) plumbing and c/heating. A boat doesn’t seem very large but the work is like building and fitting a house out on your own. The electrical installation is more complex, as there are 12-VDC, 24-VDC and a 3KVA comi-inverter giving 220-VAC, much more than one would install in any property.I did have all the skills necessary, due to working in all these trades and owning my own joinery shop, in the past (I said I had an interesting and varied life). I have been working all my life, sometimes doing 2 and 3 jobs (Doubling upon shifts etc) I was known as a work-a-holic! I continued working until I was almost 77. I found that some of the heavy work I was doing was becoming too much and I hadn’t recovered completely by the next morning. I then decided it was time to enjoy more time for myself. Now I am fully retired and still HAVE NO TIME to spare – How did I find time to undertake 3 jobs? I’ll never work that one out! Very slippery and muddy towpaths during wet weather and lack of BW maintenance of the hedgerows. Finding a lovely quiet spot, then having another boater moor up less than 6 feet away, making a lot of noise and radio full blast – especially when there are miles of unoccupied canal either side! Being on or near water is therapeutic and relaxing. Unless one has lived in the country, (I worked several years on a mixed dairy/arable farm in my earlier days) you have to experience the joy of country smells and perfumes of some flowers; the quietness (Pure Luxury) with no traffic, no aircraft; no pollution, or diesel smoke (Always excepting the fumes from one’s own engine!). As I prefer the isolated areas, I don’t have any problems from other boaters or their engines. Extend it by about 6 feet to have another room available and more cupboard space. I have both a car and a folding moped. The moped stays on the boat and this overcomes the logistics of having the car catch the boat up all the time. I usually by fresh veg when sold along the canal side, as I pass (Straight of the farm, or smallholding is minutes fresh, sometimes dug up, or pick DIY style). As my boat has a UDB fridge freezer combi, I always keep a few days supplies of fresh food. I have ample supplies of dried and tinned goods and can always find something to eat. I had no question of any problem here – Hutchinsons My 3 Fast Dongle is almost hard wired speed. No connections problems, (Other than poor weather that reduces signal strength). My dongle is protected and waterproofed, fitted externally at least 4 feet above the roof. It does usually work inside the boat but the O/S position is much better. Stratford and Oxford and similar narrow canals. It’s the difference in motoring along country lanes and motorway driving. The GU, Sharpness and K&A are less attractive but often easier to cruise. My boat is a high tech boat (Not sure is this is the best though) and is electricity/energy hungry. I have 4 large Solar panels and a wind generator. The V panels produce more energy per ? invested over the 12- months. I am able to leave my boat for a few days, knowing that my batteries will recharge enough to keep my freezer working 24/7. I have a large 24-V alternator to charge the batteries with the main engine. There is a Stirling PDAR digital controller to override the alternator limiter, Due to overheating problems the alternator is cooled with a large “snail” type of blower fan. Lovely and warm, cosy and dry, just like a miniature country cottage – S’wonderful! 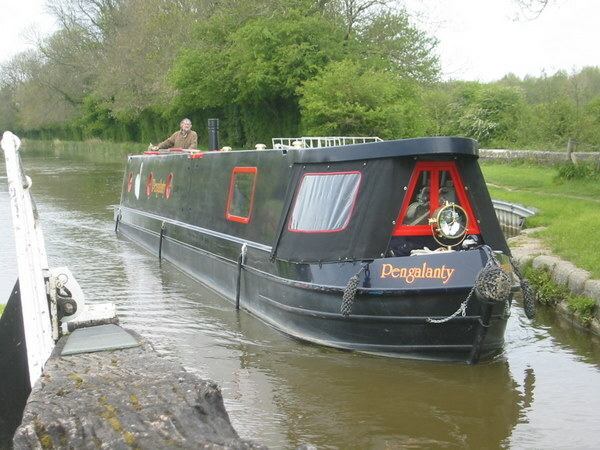 You must have a “Peep” at my web site for more information and you must have a look at my special site (With a FREE offer) of children’s story books (Ideal for canals). I don’t think I advocated free energy as you portray – I will check it out and have a look; it may be a comment from someone else’s contribution – you have me puzzled for the moment – A hearty thanks for your comment though! It does show that people are reading this site and are interested enough to “Surf” mine as well! Have you seen my other web site, with a *free* children’s story download? By the way, do you like Paul’s new Boaters’ Website and style? I personally think it is a “great” idea and Paul has received loads of positive comments! Can I ask what size solar panels you have, and how efficient the wind generater is. Up to 4 weeks ago, (When we had severe storms and unusually high winds) I had 4 x 12-vdc x 130 watt rated output Solar “Crystaline” panels. These were wired as 2 pairs of 24vdc as my battery bank is 24v. 1 pair of panels was enough to recoup the energy used by my domestic 240vac fridge/freezer. The other pair of panels helped to reduce my diesel consumption. The 4 panels cost just short of £1900.00 but with a timber frame and some furniture, it was around a £2k investment. The investment turned out to be excellent, as over the year, I was able to reduce my diesel costs by £20pw (£1000pa), so the capital cost was recouped in about 2 years. Even if it took 3 tears, I consider it a good investment. Fortunately I have a first class fully comp. insurance and when photographs of the damage of all the panels and a statement was sent to the company, they paid out in full within 21-days. Now this WAS a good service! Regarding the latest 914i digtal Rutland Wind generator, although it is considered one of the best in oputput and low revs changing capability, this is really a luxury. It would appear (From the winter months) that payback time for the wind generators will be 4 to 5 years in payback time – not nearly as good as PV panels at around a 2 year payback. However, with the short light hours in Dec thro’ February, it is a help – always providing there is enough wind and you morr in an exposed position to catch the best velocities available! I would not be tempted to purchase a wind turbine if I was staring again. Hi Allan, it sounds like you have a lot of spare cash and/or a house ashore as well. I am wondering what the actual cost of living aboard really is and could it really be a dream for someone with a limited income. looking forward to your reply. Hi Kimobi – I can’t tell you whether Allan has a lot of cash to spare but I can tell you how much you are likely to need to live on a narrowboat. Just read this post.